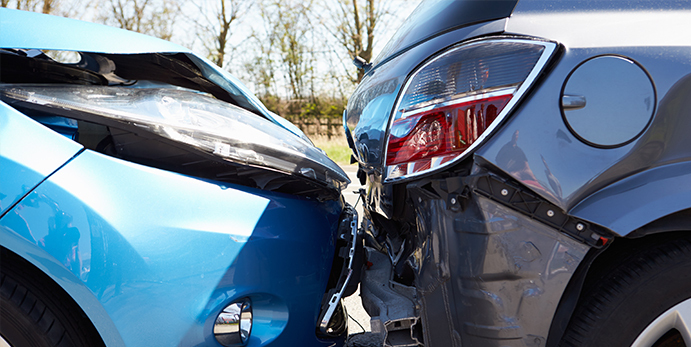 Rear end collisions are the most common type of motor vehicle crash in the United States. The National Highway Traffic Safety Administration reports that these collisions, in which one vehicle strikes the back of another vehicle, represent nearly a third of all crashes. While few are deadly, they are a major cause of injury and property damage. New crash avoidance technologies such as forward-collision warning systems and autonomous braking systems are becoming more widespread, and show significant potential for helping to reduce crashes. According to the National Transportation Safety Board, 90% of rear-end collisions could be avoided with just one extra second of warning time. But such systems are no substitute for attentive, alert driving. Here are four common sense tips that can help you avoid a costly crash! Whether you’re on highways, city streets, or rural roads, it’s important to keep a safe distance between your car and the car in front of you. A safe following distance is one that will allow you to perceive the car in front of you braking, put your foot on your brake, and stop the car safely. Choose an object on or near the road ahead to use as a fixed reference point, like a sign, a tree, or an overpass. As soon as the rear end of the vehicle in front of you passes the object, start counting: one thousand one, one thousand two, one thousand three. If you pass the object before you finish counting, you are following too closely. If you finish counting before you pass the object, you have established a good following distance. The California DMV provides a quick video explanation of how to count out the three-second rule. Driving on slippery roads. Roads can become slippery due to rain, snow, and ice. As fall continues, be sure to watch for fallen leaves which can become especially slippery when wet. Driving in low visibility. You should always increase your following distance in the dark, but seasonal weather conditions can contribute to low visibility even in the daytime. Fog, rain, and snow often limit how far you can see. Make sure your wiper blades are in good condition, and consider using a water-repellent windshield treatment. On sunny fall and winter days, glare from the sun’s low angle can temporarily blind you. Have your sunglasses at the ready, and keep both the inside and outside of your windshield free of dust and smudges for the best visibility. Being tailgated. If you notice a vehicle following you to closely, give yourself extra room ahead so that you won’t need to brake suddenly. Lose the tailgater as soon as you safely can by letting them pass you. Following a large vehicle that blocks your view of the road ahead. Hanging back will give you better visibility, and keep you out of that vehicle’s blind spots. Following a vehicle that may stop frequently, such as buses, garbage trucks, or postal service vehicles. Vehicles like these may also be required to stop at railroad crossings or other unexpected locations. Scanning the road ahead of you is essential, but you should also be alert to road conditions at your sides and behind you. If you encounter an unexpected situation - debris in the road, a stalled car, an accident, an emergency vehicle approaching from behind you - you’ll have alternative options besides slamming on the brakes, such as speeding up, changing lanes, or turning. Get into the habit of checking your mirrors frequently as you drive. Always look in your mirrors before you reduce your speed, including when you’re preparing to make a turn onto a side road or driveway. Do not stay in another driver’s blind spot, and avoid driving directly next to other vehicles. The other driver could drift or change lanes without looking and hit you, and you could get boxed in with nothing else to do but hit the brakes if you encounter a hazard in your lane. When you come to a stop, leave enough space between your car and the vehicle in front of you to be able to change lanes or pull over to the side of the road if necessary. Letting other drivers know your intentions is crucial to staying safe. It can be irritating when drivers suddenly change lanes without signaling, or slow abruptly to make a turn - but worse, maneuvers like these put everyone at risk of a crash. Rather than stopping suddenly, slow gradually when approaching a stop sign, red light, or when preparing to turn. Activate your turn signal in plenty of time for your turn or lane change. Check your signal lights frequently to make sure they are in good working order. Make sure to include your headlights, brakelights, and turn signals in the front and the rear. Since you can’t predict what other drivers will do, using these tips to keep a “space cushion” around your vehicle will give you more time and more options to react to unexpected situations.